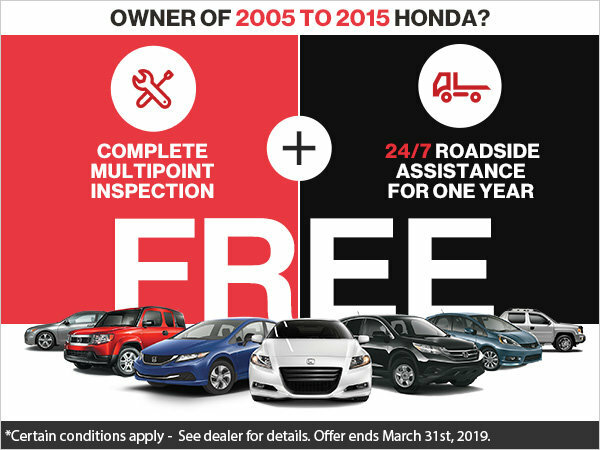 Home > Special Offers > Sales > Free Multipoint Inspection and Roadside Assistance! Free Multipoint Inspection and Roadside Assistance! OWNER OF 2005 TO 2015 HONDA ? • Coverage across Canada and the U.S.A.
Book an appointment before March 31! *This offer ends on March 31, 2019. Valid for 2005 to 2015 Honda vehicles. Limited coverage and certain conditions apply. For more information, see dealer for details.